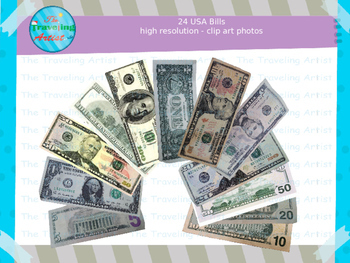 I hope you enjoy this set of USA Bills Photo Clip Art ! All photos included have been personally taken & enhanced by me - enjoy! Please see the preview to see what is included! -Do USE for Personal & Commercial uses BUT ONLY WITH CREDIT given back to me. Please contact me for a non-credit license. -DO NOT claim any of the clip art or designs as your own. your written educational product and not be used as coloring sheets, templates, or clip art. -Do Not attempt to edit these images in any way in any program with out permission from the owner. Vectoring and Tracing is not aloud. -DO NOT reproduce artwork on any physical merchandise without explicit written permission form me. Or you must own the exclusive copy write of the individual piece. -DO NOT transfer or give the license to anyone else or exchange the item that it applies to. 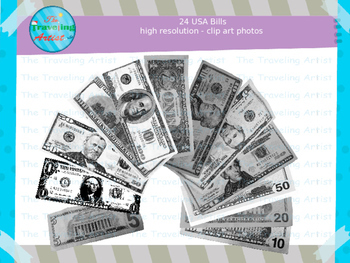 Some or all of the graphics in this presentation came from The Traveling Artist/© 2016 Joshua Ely It is a violation of copyright laws to remove the graphics from this presentation for other uses. If you wish to use these graphics for yourself, you can find them by visiting Thank you for respecting copyright laws and the artist that created them. Please contact me if you need help in anyway:)!